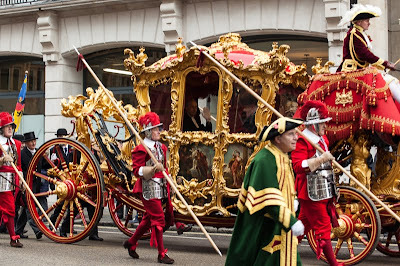 Yesterday the streets of the City of London were taken over by the pomp and ceremony of the annual Lord Mayor's parade. Alderman Roger Gifford became the 685th Lord Mayor of London. His first day included a lot of waving at old military equipment and a spin in a 250 year old gold coach (which broke down on the return journey). I never knew a lord mayor also has a coach. It looks like our golden coach with the queen. LOL it had broken down. The decoration and ornamentation of that 250 year old coach is amazing! Does he ever let Cinderella use the coach?? These are the things we Americans love about England. Our mayor rides around in a black SUV with a two-man security detail. Mo you just left a most puzzling comment on 'Sydney Eye'. I note that you have the new banner for City Daily Photo in your side-bar and that your blog "Fresh Eyes on London" is included in the relaunched portal ... however, you say there is ANOTHER portal out there in competition!! Can you provide me with the url for this, please? Eric will be ropeable. The portal for City Daily Photo was launched on 15th October to replace the one hacked in the middle of June. Eric is the owner of the domain, Peter from the Sunshine Coast here in Oz is doing all the engineering, and I am doing all the membership paperwork. That's a magnificent looking old coach. 250 years? Amazing. No wonder it broke down. I'm breaking down and I'm not even half that old! What a ride! I'm impressed it only broke down on the return:) - beautiful details. Some of the English rituals are amazing to this American. That an elaborate carriage like this one is still in existence, much less still in use, is nearly impossible to fathom.